ddmenu is a simple MooTools-based script to create you’re own context menus. The Menu Appearance is adapted to the System Content Menu behavior. You can enable or disable any selected menu items. Users can switch between ddmenu and browser default context menu easily. 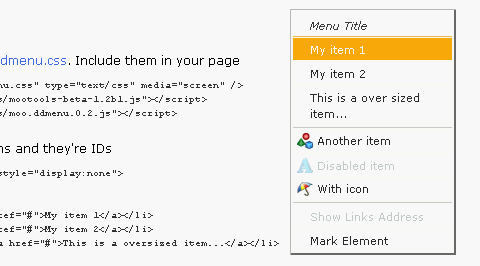 Menu styling can be easily defined in external stylesheet as well. At last, It has full A-Graded browsers support which has been tested on Firefox 2, Safari 3, Internet Explorer 6/7, Opera 9 under Windows. Firefox 2, Safari 3 under Mac OS X.